If a neighbour's dog is constantly barking or howling it can be extremely frustrating and ruin your enjoyment of your home. There is no specific law that forbids a neighbour from having a barking dog. However if the barking is constant and can be heard from inside your house, then you may be able to rely upon laws restricting noise nuisance. Just a quick note regarding dog barking. The constant barking is very frustrating and can be clearly heard inside [my/our] house. If the dog belongs to you, please could you try to stop them barking as much? If not, [I/we] will do some further investigating to find the dog's owner. I live at [address], next door. I am writing in relation to a dog barking at your property. The specific dog barking seems to be a [colour and breed of dog]. You may have previously been unaware of this noise. However it affects me because it can be clearly heard in the habitable areas of my house [and prevents me from sleeping / prevents me from enjoying use of my garden]. If this issue is not resolved, the Environmental Health Department may take action to reduce the noise, which could result in you receiving a financial penalty. I am keen to resolve this amicably; we are after all neighbours! I would therefore be grateful if you could [try to reduce any noise between 11pm and 7am / stop your dog from barking constantly at any time for more than 20 minutes / not let your dog outside when you are out of the house]. I am 71, just retired and lived in my detached home for 26 years, and had no noise problems until a year ago. The next door neighbours who are quiet in themselves got a loud barking dashund, which barks loudly on and off all day starting early, outside my bedroom, when I'm not an early person, having worked nights most of my adult life. They also slam shut their side door on an off all day, and it bellows through my house. I've developed an irrational fear, live with earplugs 24/7, have installed secondary double glazing at a phenomenal cost, which doesn't work, the noise comes through the walls. I have written notes, the council have been involved, but the outcome...nothing. My last resort, except for moving, is to move my bedroom into a tiny back room....does anyone think this might help? It also doesn't help, a builder down the road playing his loud radio all day, it has been going on for 6 months and looks like continuing.Again the council were involved, I've written notes, but again nothing. All this is seriously affecting my health, all the neighbours need to do is plane their door if it's weathered, and control their dogs barking, and the builder to turn his radio down, or off preferably ......but nothing, it's all about self self self. Anyone got any ideas what I can do? Any dog should not be outside without the owner or a responsible person. I have 2 large dogs and I am mindful if they bark I will shush them or they go in. They both have 2 walks a day and are behaved in and outside. It’s being respectful of others. Now regarding noise, unless you live on an acre of land or two we all have to live close to our Neighbours ! My next door neighbour is a single lady in her fifties who owns two dogs, a small spaniel and a large setter-type crossbreed. Since moving in about a year ago she herself has been absolutely silent - the best neighbour I've ever had in that respect - but her dogs more than make up for it. She is normally out at work for nearly ten hours a day, and also seems to spend most of the weekend out of her house, while I am virtually housebound. Her dogs seem equally housebound, and spend all day in the adjoining front room of her house. Every time anyone passes by her front garden, which amounts to around every fifteen minutes or so, they bark for a few minutes. Then the large dog starts to howl. This then starts the little dog off howling. This continues for a few minutes, usually until someone else walks by, which sets them off again. To begin with I put up with this for about six months after they moved in, thinking the dogs would settle eventually as they got used to their new environment. But, if anything, they became worse. I was initially nervous of approaching a lone older lady with this kind of grievance in case she might feel threatened. I have mobility issues myself, however, and have only managed to catch my neighbour twice to speak to her about it. The first time she made a good show of being apologetic and claimed to be mortified that the dogs were disturbing me while she was out. For a few weeks, she moved them outside into a shed while she was at work, and while I could still hear them, the noise wasn't loud enough to drive me to distraction any more. Then for some reason she decided to move them back into the house during the day and the whole sorry situation resumed - and if anything the howling became more annoying than before. I managed to speak to her a second time about it and her only response that time was "Well I'll be retiring in three years, if that helps" ! As I said earlier, the howling hasn't just started up again, but it has intensified. The howling doesn't happen when she is there (occasionally the barking does), so I imagine she doesn't believe me about the howling or its intensity. The dogs are clearly suffering from some kind of separation anxiety, but when I broached the subject with her she didn't seem to even understand what I was talking about. I now feel that I've done more than enough to try and settle the matter amicably, so am I now justified in involving an outside agency now that it is clear she doesn't seem inclined to do anything to remedy the situation? We have 'drop out' neighbours, who own the house but live off the state as they have a son who is terminally ill.They also have two other children (secondary school age).They also have a dog which barks up to seven times per day for up to 40 seconds at a time.We have communicated to them that we can hear the dog barking each time.The council say the barking has to be excessive for several hours per day before they can actThe dog is barking whilst the house is occupied so the owners are not keeping it quiet of even trying to.During the day the dog is reasonably quiet but after the children come home all hell lets loose.I have come to dread evenings and weekends.What can I do?We have spoken to our neighbours about the problem but they do nothing constructively about it. No normal, civilised person allows his/her dog to bark and make neighbours' life a misery.People need some peace and quiet in their own homes, and have the right to enjoy their gardens, too. We have 2 Westies, well known fir their barking ability. There is a particular neighbour who constantly shouts “shut that bloody dog up”I have monitored every bark this morning and it adds up to no more than 5 minutes of intermiitent barking between 6:30 and 12:30, is it reasonable to consider this exessive? Talk to environmental health to see if they can you give you an idea of the levels. To be fair, 6.30am is quite early for any dog to be barking. We have 2 Westies, well known fir their barking ability. There is a particular neighbour who constantly shouts “shut that bloody dog up” I have monitored every bark this morning and it adds up to no more than 5 minutes of intermiitent barking between 6:30 and 12:30, is it reasonable to consider this exessive? @norealsaint.It's people like you who don't take any responsibility for barking dogs that give us dog owners who do a bad name. Instead of taking the time to post some ridiculous justification do a google search on bark deterrents instead.You admit yourself that your dog barks "we have logged his barking ourselves" but somehow your barking dog doesn't matter. You excuse your dog barking because he's barking in "response to another dog." So you're telling us that every single time he barks the other dog barks first?It's a moot point either way. 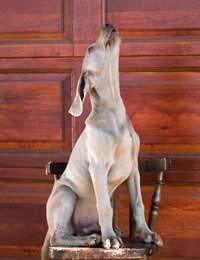 The fact is your dog is barking ... have some common courtesy and do something about it. Harassment? LOL. So if you are cooking meth in your backyard and your neighbor complains that's harassment too I'm guessing? I think it's funny that you're reporting the situation to the police yourself. Then since your not resolving the issue they can help. We have been getting Anonymous letters claiming to be from a neighbour regarding our dog barking. In mind of the fact that we have logged his barking ourselves, and on the occasion he does bark it only happens in response to another dog barking, and even then not always as I sit here listening to another neigbours dog barking. Now I am taking these letters,to the Police as I am advised this is actually harassmentand in contrast to a dog barking actually a crime. My neighbours move in two and half years ago. Since then the wife has screamed abusive language at me on a regular basis, also to my neighbour on the other side. This behaviour is getting worse and the other day she told me tof**** kill myself. Thier dog constantly barks, and the husband is passively aggressive. I've kept logs and my housing association as been out to visit them, as have the police. Two years later this behaviourstill going on, and nothing is being done to protect me. I'm in poor health, live alone am a a pensioner who looks, especially to live quietly in my garden,but for some reason this woman has taken against me. I've become a nervous wreck, I can't sleep and now am being treated for Post traumtic stress and depression, hasany body advise theyou canada give me?